KANSAS CITY, Mo. — Little moments can make a big impact. That’s part of the rationale behind community policing efforts championed by Kansas City, Missouri, Police Chief Rick Smith. But sometimes those officers take the call to serve above and beyond — as Community Interaction Ofcs. John Lazano and Robert Pavlovic along with Impact Unit Ofc. Aaron Hiebert recently demonstrated. "We are there to help people; we’re not just there to put handcuffs on people," Pavlovic said. "There are so many different things and events we can help with." After Lindsay Moran, a social worker with the Shoal Creek Patrol Division, learned of a family that had no beds, she got them one. Lazano, Pavlovic and Hiebert teamed up to deliver it it to the family’s residence, haul it inside and set it up. "I can relate directly. I was a refugee, I was homeless, I didn’t have beds," Pavlovic said. "Once we put (the bed) together I knew exactly how it felt." By embedding officers more deeply in the community, Smith hopes to foster increased trust and cooperation and, ultimately, to make a dent in the rising plague of violent crime in KCMO. Smith announced plans to add a social worker at each of the department’s patrol divisions in January 2018. It was the continuation of an effort that started with the hiring of Gina English as KCPD’s first embedded social worker in December 2016. 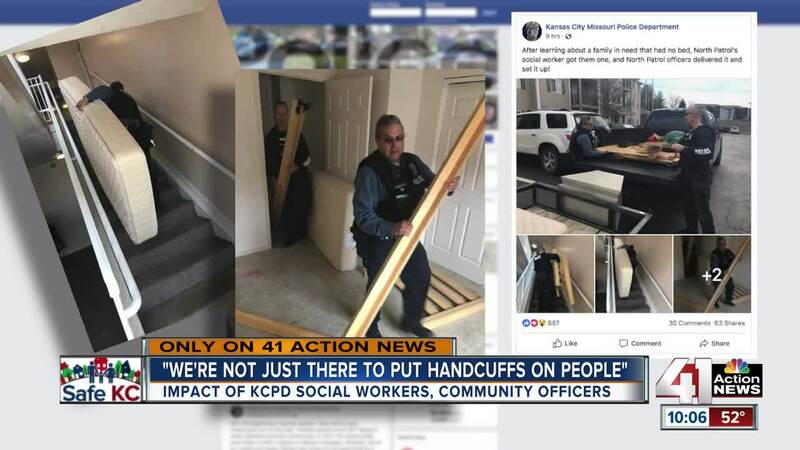 After placing social workers in the divisions with the greatest need, like the East Patrol Division, KCPD built up the program. The concept isn’t new, but it’s continuing to make a difference now that Smith’s vision has been fulfilled. Social workers were hired for the Northland patrol divisions late last year. "We’re busy. We’re busy because there is a need and we’re busy because our officers look for opportunities to make referrals to us, which is a huge part of our partnership," Moran said.